Do you enjoy walks along Vancouver’s glorious English Bay? Or perhaps you’re a seasoned athlete, looking to best your last half-marathon time. Maybe you’re dedicated to ending violence against women and children. Maybe it’s a little bit of everything! Regardless of your motive, we have a spot for you on Team Dixon. This year, all the funds raised for Dixon Transition Society during the Scotiabank Charity Challenge (yes, 100% of what we raise goes straight to our programs!) will go to our Child Support program. Many of the children who come to us have often witnessed violence, if not directly experienced it. We know that children who grow up to respect women and learn how to express emotions in a healthy way are an indicator of the cycle of violence being broken. We want the children in our care to grow up safe and happy, with every opportunity to succeed and go the distance. Because of this, we design programs with their mental and emotional well-being in mind. Dedicated Child Support Workers at Dixon Transition House and Wenda’s Place model healthy behaviour for the children. Our child support program also offers fun and educational group activities, like arts and crafts sessions and workshops. Unfortunately, the funding for this vital program is about to be entirely eliminated. This year, our goal is to raise $20,000 during the Scotiabank Charity Challenge so we can keep the child support program running at Dixon! 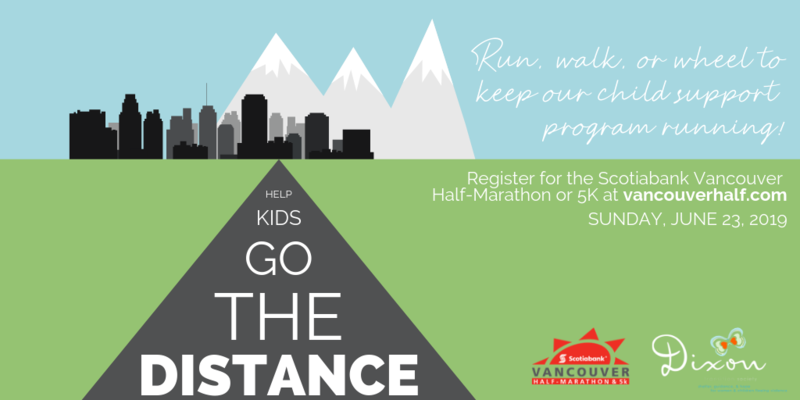 The Scotiabank Vancouver Half Marathon and 5K presented by Canada Running Series is a highlight in the city every year. Scotiabank is an amazing community partner that is excited about seeing charities thrive and collective impact happen, so each year they sponsor the event so that charities can recruit teams and carry out peer-to-peer fundraising campaigns. The best part? Scotiabank covers all of the processing and administrative fees for funds raised so that everything you raise or donate goes directly to the need! We also have a 15% registration discount if you’re racing for Dixon, so get in touch with us and let us know that you would like to go the distance for Dixon if you would like the code! When you’ve finished the entire race registration process, you will have your very own fundraising page that you may then share with your network and begin to rally support. All funds raised through your site (as well as any personal cash and cheques that you raise), go directly to Dixon. Tax receipts will be issued accordingly. Questions? Give us a call at 604-433-4191 or email us. We’d love to chat more! 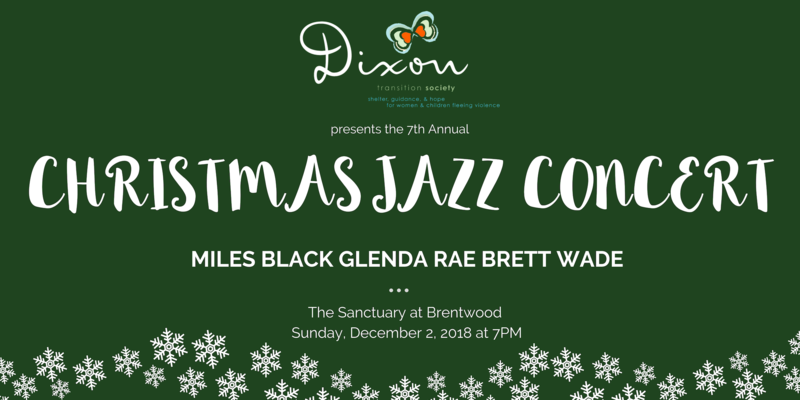 Dixon Transition Society is thrilled to present its 7th Annual Christmas Jazz Concert. The concert once again features fantastic local artists Miles Black, Glenda Rae, and Brett Wade. This always festive and joyous evening includes a silent auction, refreshments and beverages, general merriment, and of course, fantastic jazz music. This year all proceeds raised at the concert will go to Dixon House. Dixon House is our 10-bed home, where women and children often come immediately after escaping abuse. The House is staffed 24/7. While there, women can access food, clothing, personal and household supplies, workshops, counselling, and so on, all at no cost. Don’t miss out! Buy your tickets for our 7th Annual Christmas Jazz Concert today.